Public debates about the terms of membership and inclusion have intensified as developed economies increasingly rely on temporary migrant labour. While most agree that temporary migrant workers are entitled to the general protection of employment laws, temporary migrants have, by definition, restricted rights to residence, full social protections and often to occupational and geographic mobility. This book raises important ethical questions about the differential treatment of temporary and unauthorised migrant workers, and permanent residents, and where the line should be drawn between exploitation and legitimate employment. Taking the regulatory reforms of Australia as a key case study, Laurie Berg explores how the influence of immigration law extends beyond its functions in regulating admission to and exclusion from a country. Berg examines the ways in which immigration law and enforcement reconfigure the relationships between migrant workers and employers, producing uncertain and coercive working conditions. 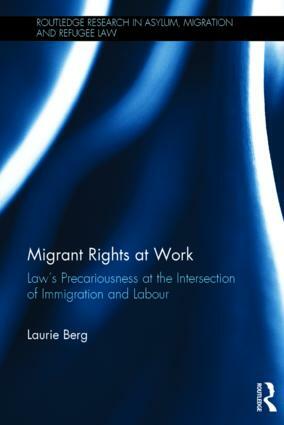 In presenting an analytical approach to issues of temporary labour migration, the book develops a unique theoretical framework, contending that the concept of precariousness is a more fruitful way than equality or vulnerability to evaluate and address issues of temporary migrant labour. The book will be of great interest to scholars and practitioners of immigration law and employment law and policy.